LOS ANGELES (AP) — Kobe Bryant and Pau Gasol spent the final minutes of the Los Angeles Lakers’ final game arguing in Oklahoma City, disagreeing on the best way to run a pick-and-roll play. It might have been the tandem’s last few minutes together with a franchise that has little patience when even great players stop bringing home rings. The Lakers were eliminated in the second round for the second straight year Monday night with a five-game loss to the Thunder. Although the Lakers had a solid season despite getting no real training camp to make the enormous switch from coaches Phil Jackson to Mike Brown, they weren’t as good as the NBA’s best. That likely means changes for a franchise and a fan base that considers seasons ending before June to be abject failures. In Lakerland, it’s easy to forget that the large majority of NBA franchises would be quite pleased by a 41-25 regular season, yet another Pacific Division title and a decent performance against the Thunder, clearly a top-four team. Many teams would be excited to retool a roster topped by Bryant, four-time All-Star big man Gasol, and emerging All-Star center Andrew Bynum, who frequently dominated during his best pro season. But no franchise has the incredibly high standards of Bryant and the 16-time champion Lakers, who don’t even acknowledge division titles that would be a significant achievement for other teams. A second-round playoff loss to a better team caused panic and widespread soul-searching Tuesday. Gasol endured his toughest season since arriving in Los Angeles in early 2008, dealing with uncertainty and disappointment after the NBA rejected a trade that would have exiled him to Houston last December for Chris Paul. The genial Spanish 7-footer averaged a career-low 17.4 points while failing to find a consistent role in new coach Mike Brown’s offense before struggling mightily in the playoffs. Gasol, who will make more than $38 million over the next two seasons, handled the scuttled trade with his usual grace, but his fans and teammates weren’t always so generous. Bryant called Bynum the Lakers' second scoring option during the season, but called out Gasol for not scoring more in the postseason, ripping into Gasol after Game 4 last Saturday. The 24-year-old Bynum was outstanding for most of his seventh NBA season, averaging 18.7 points, 11.8 rebounds and 1.93 blocked shots while staying healthy. But just when most Lakers fans are ready for Bynum to sign a maximum contract extension, he provided one more reminder of his questionable maturity and leadership potential when he didn’t shake hands with the Thunder after managing just 10 points and four rebounds in Game 5. Bynum has made numerous immature mistakes over the past year, which began with rampant rumors of his own departure for Orlando in various trades for Dwight Howard. Yet Bynum also raised a key point: The Lakers were a work in progress all season long after Brown replaced 11-time NBA champion Jackson, requiring a dramatic adjustment in everything from a new offense to practice structure. The Lakers made other changes that hampered their championship hopes, trading valuable big man Lamar Odom for nothing when his feelings were hurt in the preseason. Los Angeles also dealt emotional leader Derek Fisher at the trade deadline while landing replacement Ramon Sessions and surprising big man Jordan Hill. Fisher is outmatched as a starting NBA point guard, but his leadership and five championship rings were missed. Sessions has a player option for next season after a tantalizing but inconsistent debut, while most of the Lakers’ reserves will be free agents. Los Angeles had one of the NBA’s least impressive benches, so a wholesale overhaul of the bottom of the roster couldn’t really hurt. 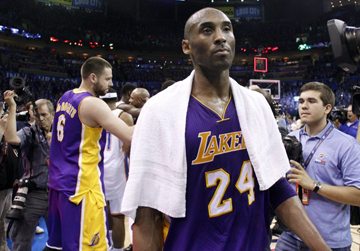 The Lakers also endured another year of the drama that seems inevitable for this high-profile franchise. In the last month alone, they dealt with Metta World Peace’s seven-game suspension for throwing a vicious elbow, Hill’s felony assault charge from his time in Houston, playoff hero Steve Blake’s Twitter death threats for missing one shot, and Magic Johnson’s declaration that Brown would be fired if the Lakers didn’t survive the first round. All that upheaval is nothing new to Bryant, who got a concussion and a broken nose in the All-Star game. But leave it to the mercurial World Peace to declare the Lakers’ plight might not be as terrible as many believe.